FoxMind is a game company that launched in 2000 with two games Squad 7 and Crazy Circus. Squad 7 instantly became an award winner and helped pave the way for FoxMind to reach store shelves and playrooms around the world. FoxMind games are easy to learn, quick to play, smart and fun. They currently offer over 80 games as well as electronic games for iPhone and iPad. We received a copy of Time in a Box to review, however this is not a game. 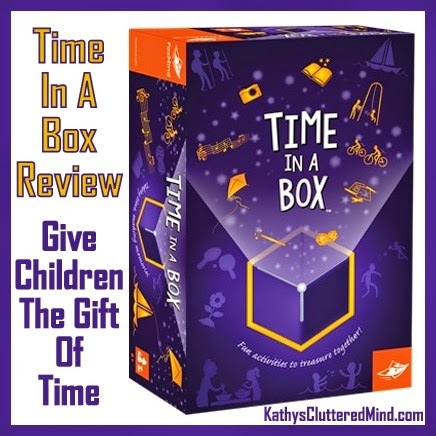 Time in a Box is a unique, one of a kind way for you to give your child what they are yearning for and deserve most...your time. This couldn't have arrived at a better time. I was recently contemplating New Year goals and one of them is to slow down a little bit and get back to spending more quality time with my children. Time in a Box is the brainchild of child psychologist and writer Rute Moreira. The idea behind the product is to get parents to dedicate time to their children...no matter how busy they are. This amazing product will have you trying new things, exploring art and science, planning for the future, considering the past, and most importantly letting your child know they matter to you! Time in a Box is for 2 players age 6 and up (one adult and one child). I do think it could be easily used with multiple children too...with a little tweaking. Inside the box you will find 96 activity cards that allow a child to shift your priorities and focus on doing a special activity together. These activities include playing a board game, solving a puzzle, visiting a local fire station, starting a family tree, making a blanket fort, etc. The cards are divided into four seasons and there are enough cards to do two activities per week over the course of a year. Also inside each card is a space to document your experiences together. This is where some tweaking would need to be done if you have more than one child. What I plan to do is start a family "Time in a Box" journal where both children can record their thoughts on each activity. You can also take photos during your activities and add them to your journal or add them to a special Facebook album. And the unique and beautiful box can serve as a memory chest where pictures, notes and journals can be collected and treasured. So not only is Time in a Box a special way to spend time with your children, it also provides you with a special keepsake for you and your children to cherish for years to come. Also included is a simple written agreement between you and your child that sets the ground rules which you will both abide by. When a card is chosen by your child you must drop everything you are doing, switch the cellphone off and do the activity. If for some reason the activity cannot be done right then and there you can always have your child choose another card and negotiate when you will complete the other activity. When you give Time in a Box you are offering a child you care about the gift no one else in the world can give them: your time. This would make an excellent gift for the upcoming holidays and is a great way to kick off the New Year! 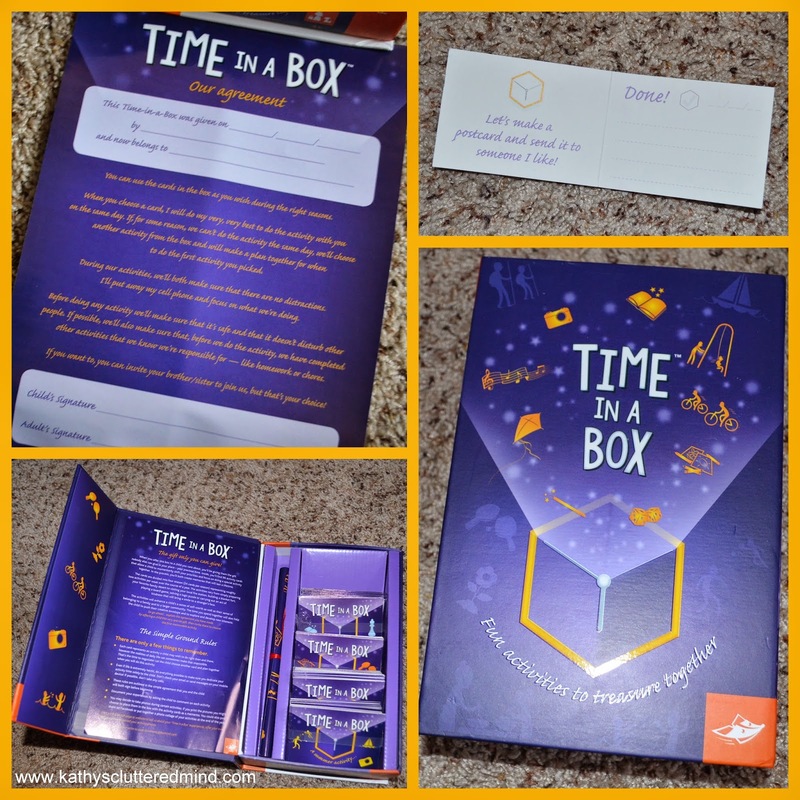 Time in a Box is $17.95 and can be purchased on Amazon or at several local retailers.